A basic tee, like this one from Sosie, is one of my favorite items to wear because of how versatile it is. You can dress it up or you can dress it down by just changing a few key pieces like your bag and shoes. Today’s look is super laid back and casual, perfect for a Saturday running errands or exploring the city. What are your favorite ways to wear sport a tee? Thanks to Sosie for sponsoring this post. Love the pop of neon! Great casual look ! What a great look, i love every single detail! You can never go wrong with jeans, a tee and some converse sneakers, I love that comfy look. Such a great sporty outfit! You look lovely! Cute casual look, love this tee. If you get the chance, join my linkup today to share your amazing post. Love this casual look! You have the most amazing style that you can make a casual look so chic, yet still look effortless! I love it! That tee is perfect. Love your jeans, the bag is everything. I love the pop of neon in this look. SO great! Such a perfect casual look for summer. Love the pop of neon! Such a cute casual look, Rach. The pop of neon is so much fun. Basic with neon…I love it!! There are few things better than a great t-shirt and jeans. I love the pop of color from your bag! totally love those basic looks! I absolutely love this look, the sunglasses are gorgeous! Love to see you casual…. 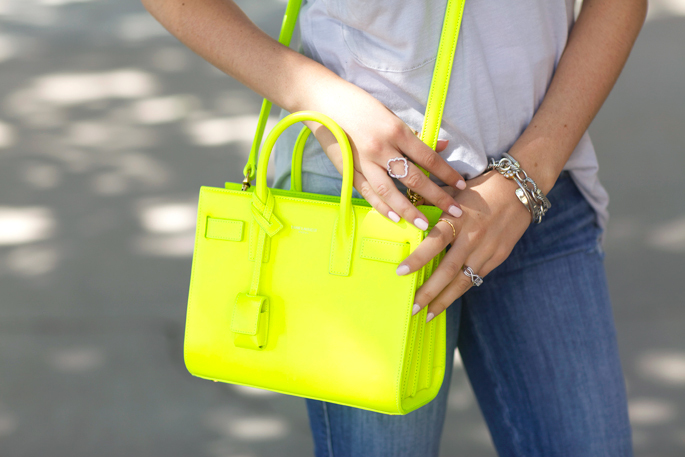 Loving the pop of neon yellow from your bag! Such a perfect casual outfit for a weekend around town! White converses are quickly becoming a must-have in my closet for weekend wear! Awesome simple look, love the bag. Nothing beats a basic tee and jeans…. I love your accessories for this outfit! That neon YSL is to die for. Hope you had a great 4th! Love this basic outfit, with the pop of color! This is one of my favorite looks! You look great like always. Adorable! Love those white converse, they go great with everything!! I love this laid back look! 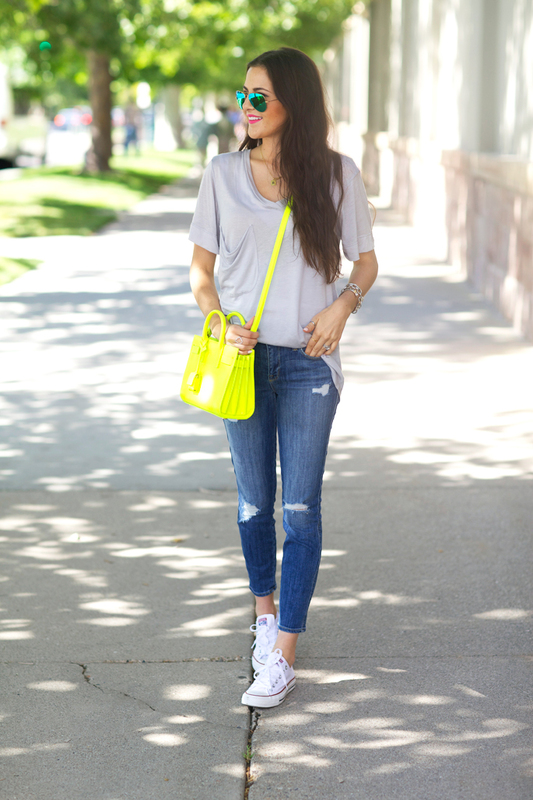 Love this casual look with the pop of neon! I just bought one of the Shop Sosie Piko tops in like 5 different colors….and am officially obsessed! Love how loose and cute they are! I love a basic tee with a bright, printed skirt. Cute outfit post! I’m loving this casual look! I seriously need to get a pair of white Chucks so bad… They’ve been on my list forever and I keep forgetting! The outfit might be basic, but that bag makes it exceptional! Love that neon pop! xo! You look amazing even in basics! love to see these laid-back summer looks. so perfect for these sometimes outrageous temperatures where you want to look comfortable and chic! Love the outfit. I also have the converse. How are you cleaning them? You make basic look good! Wow – Love this bag! Love this slouchy tee! It looks super comfy without sacrificing style. Those Converse are the perfect accessory for running errands! Love to see you in a more casual look! Very cute! When you have these sunglasses and bag, you do not have wear much to look cool. I love this casual look for a day after the 4th of July weekend! Those sunnies are amazing, you always look put together! simple and chic! love the pop of color! Casual t’s are the best, I love wearing them to and from hot yoga, running errands, and on lazy rainy days during the summer with cut offs. This look is great – love the pop of color with the cross body bag. That bag makes the outfit so much fun. absolutely love it! The perfect casual look! It’s fun seeing you rock your Converse kicks more often. And I’m always loving a pop of neon!! Your hair looks fabulous, too!! The relaxed waves really fits your look. LOVE. LOVE. LOVE. those glasses! Think I’m gonna have to invest in a pair. I’m absolutely obsessed! Love the outfit rach! Casual and cool! Like so much this basic look!!! Cute casual look! The bag adds a perfect touch! Love it! So funny! I am wearing the same shirt right now! I LOVE it, so soft! Totally love the look, from bag to jewellery… Spot on! I love the neon purse paired with the converse. Love this simple look! Even jeans and sneakers look amazing on you! This is my favorite way to wear a tee. I love being cozy and casual. Love this look, it looks so comfy!! The pop of color in your handbag is perfect!! very nice outfit and the eye-catchy bag! I love the pop of color! I could absolutely see myself in this.